Martha Stewart will return to the Newport Mansions Wine & Food Festival for her second year, headlining a brand new signature event with French chef Jacques Pépin. During A Conversation with Martha Stewart and Jacques Pépin, guests can enjoy a lively and engaging conversation with the lifestyle expert and the French chef while sipping Champagne Taittinger in the Marble House Gold Ballroom before heading out to the Grand Tasting. Stewart, an Emmy Award-winning television host, entrepreneur and best-selling author of 83 books (and counting), and Pépin, an internationally recognized chef, cookbook author, and cooking teacher who has published more than two dozen books and hosted 11 acclaimed public television cooking series, will discuss what’s hot and what’s not in lifestyle and food trends, providing the audience with a rare opportunity to engage with them in a spectacular setting. The elegant Friday night Wine & Rosecliff gala will feature a special selection of fine wines and food amid seaside Gilded Age splendor. Also returning is the Collectible Wine Dinner at The Elms on Saturday night. This esteemed dinner will give guests the chance to taste and learn about a variety of high-end collectible wines paired with delectable dishes. All of the wines will be hand-selected by the Festival’s Director of Wines, Michael Greenlee, a 25 year veteran of the industry. The Presenting Sponsor of the 2015 Newport Mansions Wine & Food Festival is FOOD & WINE Magazine. Additional sponsors include National Trust Insurance Services, KitchenAid, Alex&Ani, Atria Senior Living, Newport Hospitality, Inc., Hyatt Regency Newport, Hotel Viking Newport, Residence Inn MarriottNewport/Middletown, The Newport Harbor Hotel and Marina, Alaska Seafood, Chef Works, Arrow Prestige Limousine & Coach, Marchesi Antinori, Maple Leaf Farms, Ruffino, Dock & Harbor Maine, Harney & Sons Fine Teas, WhistlePig Rye Whiskey, Verterra Dinnerware, Meridian Printing, Brinley Gold Shipwreck Rum, Bouchaine, Coravin, Guittard Chocolate Company, Champagne Taittinger, Sequoia Grove, Nobilo, Coca Cola Bottling Company of Southeastern New England, and United Airlines. For more information and to purchase tickets for the 2015 Newport Mansions Wine & Food Festival, visit www.NewportMansionsWineAndFood.org, call (401) 847-1000. Their Facebook page is Newport Mansions Wine & Food Festival. Newport is many things to many people. It's a resort town. It's a thriving city with a rich and storied past. Unlike the Hamptons, Cape Cod or the surrounding islands, in addition to beautiful sights, beaches, fine dining it offers a culture that no other summertime resort offers. With our historic Redwood Library and Athenaeum, the Newport Art Museum in addition to all the magnificent mansions, Newport is beauty and history and yet offers some of the loveliest beaches, and recreational activities. Newport is also a top destination for some of the greatest sailing and a former home of the America's Cup World Series Sailing. Many people who come to visit often have several restaurants, mansions, The Cliff Walk and shopping on their radar. Many don't think to see the beautiful city and surrounding areas by water. Boats can be easily chartered for a couple of hours at a time or longer. There are all sorts of sailing experiences and opportunities and it amazes me that until just a few weeks ago I had never taken advantage of these treasured experiences right in front of me! Together with a friend we made a reservation for an afternoon sail on the Nefertiti, an America's Cup Charters boat. It came with a crew and all we had to do was board the boat and experience the most amazing sail in Newport harbor. While not a sailor myself (my parents did try, but I never really took to it) I do love the feeling of freedom of being carried by the wind on the water. I can think of nothing better. From the water you'll see some of Newport's most iconic landmarks such as Fort Adams, The Eisenhower House, Hammersmith Farm, Castle Hill Inn as well as the wonderful properties of Jamestown. Sailing not your thing? There are power boats that can be chartered as well. For information about pricing and the various different experiences and packages they offer, visit the America's Cup Charters boat website. I enjoyed my afternoon so much that I think this will have to become an annual event. Below are some of the images I captured aboard the Nefertiti... and I'd like to extend a great big thank you to our amazing crew! The McDonald's Lobster Roll, am I Lovin' it? It started off innocently enough. It was nearing dinner time as we were leaving Newport and wanted some sandwiches for the ride home. Our original plan was to stop off at a local deli, but the deli was closed and we needed a back-up plan. My youngest begged for McDonald's. While we are not McDonald's regulars, my youngest does love a good Happy Meal and so once or twice a year, when we are on the road, this iconic fast food company bearing the logo of the yellow golden arches becomes a part of our food landscape. This is how my Lobster Roll arrived, in a cardboard box not unlike that of a Big Mac or Quarter Pounder, just in a different shape. It was supposedly prepared fresh for me. I wasn't paying attention. I wish I had been! This is what the image looked like on the poster. I snapped a picture on my phone for comparison purposes. Usually, I find, food looks better when professionally photographed for an advertisement. 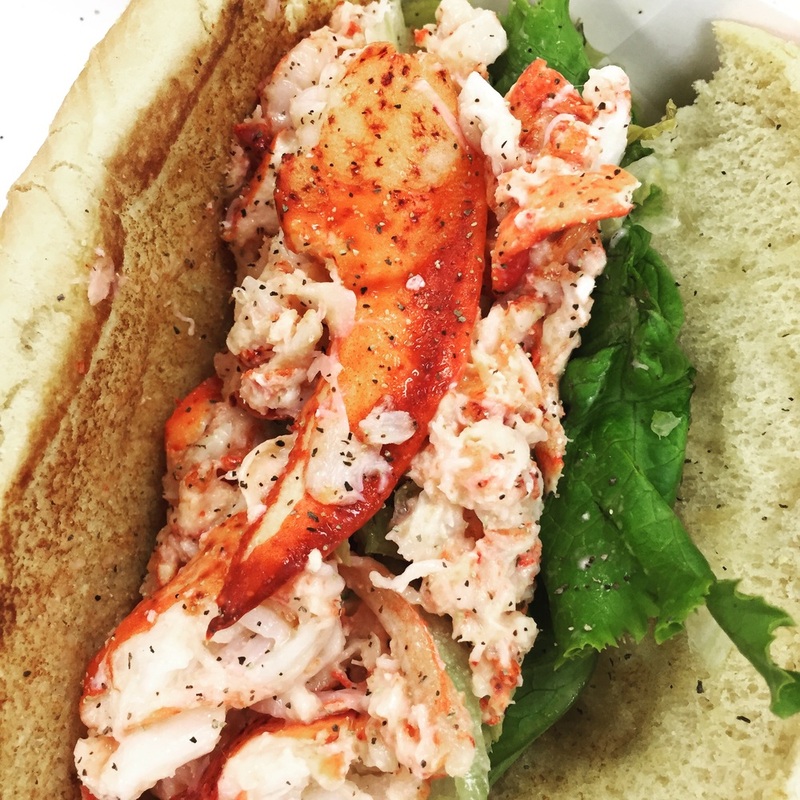 The McDonald's Lobster Roll. Image property Jessica Gordon Ryan. Taken with an iPhone 6. This is what my Lobster Roll looked like. Impressive! I actually think it looked better than the poster! And another shot, a slightly different angle. Again, I'm quite impressed. There was a generous helping of meat, claw and tail. But the truth would be revealed when I bit in. And so I did. Dressed in mayonnaise, (as opposed to butter), I found the lobster to be plentiful, tender and sweet. The sandwich was just slightly bland to me, so I added some salt and pepper which helped. I took another bite. The lettuce was fresh and offered a nice crunch. The bun was toasted, though still soft the way mcDonald's buns tend to be. This really wasn't bad. As I slowly ate my sandwich, my oldest son kept asking if my stomach was hurting yet. While my daughter, who's away for the summer in Maine, and whom I'd just texted, said "Mom, that's just sketchy." I continued to eat and with each bite I took I remained pleasantly surprised. My overall thought. This sandwich was really quite good. Was it the best I've had? No. Was it the worst, not at all. Would I order it again? Absolutely. For those of us who spend a good amount of time on the road there are very few healthy options. The few regional and national healthy fast food chains that do exist readily accessible to most travelers. I'm not a fan of McDonald's grilled chicken sandwich. I find it to be too rubbery, with not enough meat and much too much mayonnaise. Their salads don't impress me either. The same can be said for the other fast food chains out there. And so, not only was the Lobster Roll really quite good, but at just 290 calories it's a viable and healthy option for those of us who want to watch our waistlines. (It should be noted that I did not order fries!) 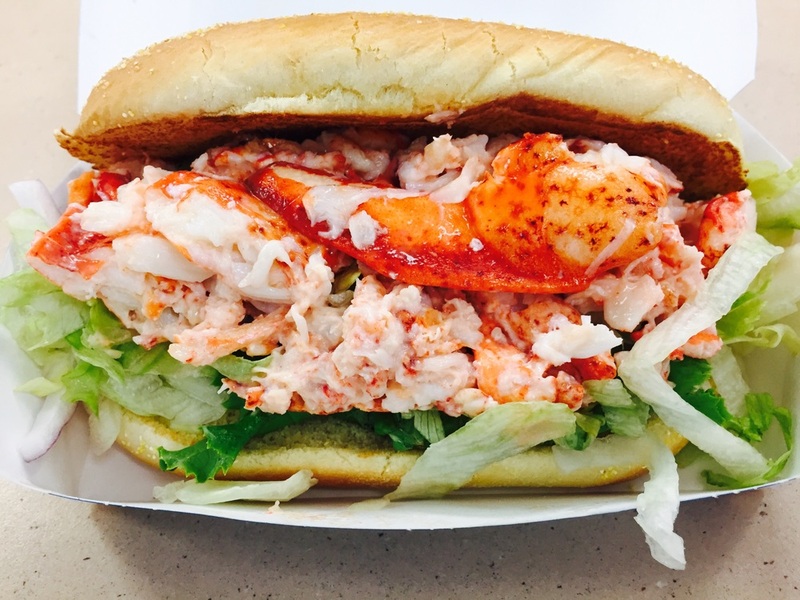 Furthermore, you'll be hard-pressed to find a lobster roll anywhere for under $10! So was I lovin' it? YES! 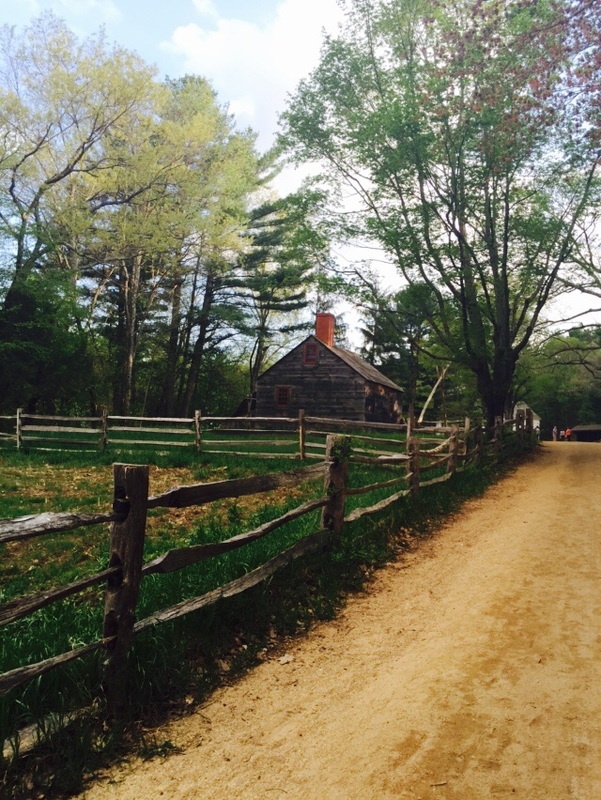 Old Sturbridge Village is the largest living history museum in the Northeast. Situated on over 200 scenic acres it depicts an authentic rural New England town of the 1830s. Guests are invited learn about and explore the more than 40 original buildings on the property, including homes, meetinghouses, a district school, a country store, a bank, a working farm, three water-powered mills, and trade shops.Visitors will get to see heritage breed animals up close and interact with authentically costumed staff. 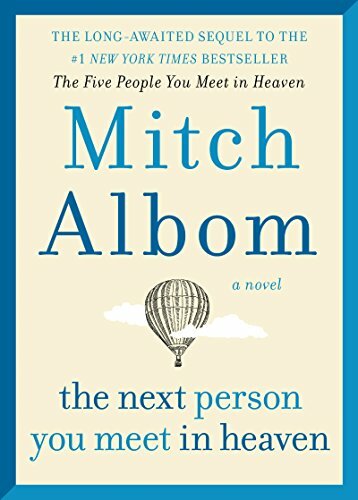 I've long believed that the best way to learn is to step away from the textbooks and to experience things first-hand. 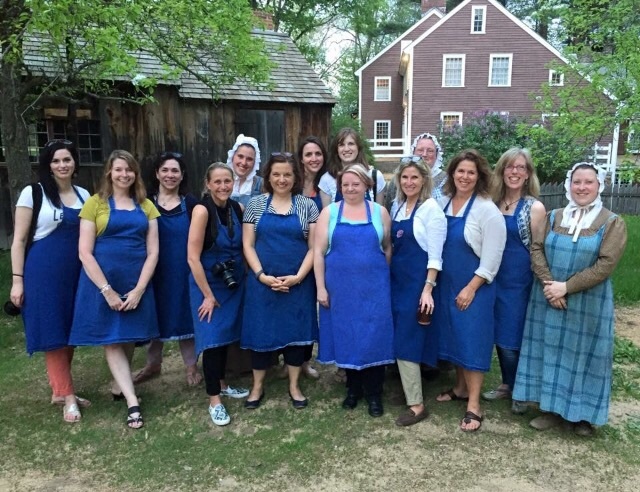 Last Monday I had the pleasure of joining some of the editors of Yankee Magazine and The Daily Basics at Old Sturbridge Village for an authentic Colonial Dinner. The evening was not at all what I had anticipated - it above and beyond exceeded my expectations. For all the times I have visited Sturbridge Village both in my youth and as an adult with my own children, I must say there was something purely magical about visiting after hours, sans crowds, as you can truly picture life in colonial times. The landscape was breathtaking, especially at the hour just before sunset - with the sun not quite low on the horizon and still bright, with dark rainclouds that loomed, threatening - but only threatening. The newly emerald colored trees and grasses, the ochres of the sunlit shadows with pops of white and lavender just recently bloomed. Here in New England, we are very accustomed to this architectural era, least from the outside, but wander inside the buildings and you are truly transported back in time - a living history. We walked around the grounds, mouths and eyes agape, as we soaked in the natural beauty clicking away with our cameras. We spied, barns, and churches, banks, and animals, rectories and homes. As we wandered through the town, following our noses, we headed over to a colonial home where the rich aromas from the kitchen and sweet smells of the lilacs just outside were truly intoxicating. As we made our way inside we were greeted by Victoria, Jean and Ryan, our 3 lovely host historic interpreters who gave us an in-depth lesson on Colonial life. It happened to be a hot and humid day as temperatures flirted near the 90 degree mark. The kitchen was hot, the dining room only slightly cooler when the occasional gentle breeze managed to find its way through an open window. The trees outside, now mature, would not have been during Colonial times. There would not have been much respite from the heat. During the morning the windows would be kept closed and shades drawn to keep the house dark and cool, then later in the afternoon windows would open. We were greeted with a choice of two wonderful cooling beverages, Raspberry Shrub and A Cool Summer Tankard. Made with borage leaves that have a taste much like cucumber, and port this beverage was very refreshing. The Raspberry Shrub was made from a mixture of crushed raspberries, vinegar, sugar and water. I imaged this to be the Fruit Punch of the Colonial tots! Both were excellent. We then sampled Potted Cheese, reminiscent of today's Port Wine Cheese. It too was quite good. Recipes for everything will follow in the next post. OSV is a true working farm. They produce their own milk, meat and and vegetation. The milk from their goats is used to make their own Cheshire cheese, a hard cheese that has a nutty flavor and texture reminiscent to that of Parmesan cheese. After we sampled our cocktails and crackers we made our way into the kitchen. Our hosts worked away in the kitchen, tending to the lamb that was roasting away on a spit in the fireplace. I asked them if the meat was seasoned and was told that only salt and pepper was used. The lamb's juices were dripping onto the Jerusalem artichokes below. The kitchen was hot and the day's heat added to the overall temperatures. The ladies explained to us that their dresses, in layers, and their aprons actually helped to keep them cool and shelter them from the heat of the fire. Like oven mitts protect our hands from the heat of modern day ovens, the layers of clothes had the same effect. While the lamb, parsnips and salad were being prepped we had our hand at the desserts. We took turns making a chocolate beverage by shaving chocolate made from cacao beans that would be enjoyed after dinner with a trifle that we had a hand in preparing as well. (My job was to add a gill (Colonial measurement) of Brandy to the trifle. I may have added just a wee bit more! We whipped cream with twigs - a process that takes quite a bit longer than it does with a KitchenAid! When the desserts were made many of us stepped outside into the cooling evening air while our Colonial hosts finished up in the kitchen and then started the table setting. We ventured back in to help. 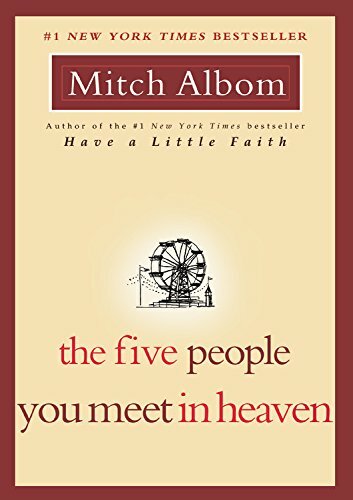 As we placed the blue and white plates on to the tablecloths, we were told that the "the birds belong in the sky, not down below." As we set the table today, forks went on the left and knives to the right. We sat down, said grace and started to eat. I admit to being surprised at just how delicious everything was - the lamb, sweet and succulent was the best, perhaps, I have ever had. (We were told that milk fed beef and lamb is much sweeter than grass fed.) Our history lesson continued while we were seated as we learned that in Colonial times it was proper to eat with one's knife, sharp side facing out. Both the knife and fork were used for cutting, but the knife was used as the vehicle to deliver food into the mouth. Women wore their serviettes (napkins were diapers used on the young) tucked into their necklines, secured with pins, not on the lap as we do today. At the end of a meal the men gave toasts, while the women gave sentiments. As we dined we learned more about Colonial life and customs - that much of what was practiced then is still practiced today. We have come so far, yet the root of all that we do is so steeped in tradition, that much is the same. Although in Colonial times meals were eaten in dining room - so the mess and the heat of the kitchen could be closed off - we ate in the kitchen because it was large enough to accommodate us all. After dinner we sojourned into the dining room for our after dinner treats - the homemade warm chocolate beverages and the trifle. Dessert was not commonplace at most meals, but was served when company was present. I left at the end of the night knowing that I had participated in something that was truly special and one of a kind, an experience that I will forever treasure. I would like to express a huge and heartfelt thank you to Yankee Magazine for inviting me along and including me in this incredible experience, to Darin Johnson and Michael Arnum with Old Sturbridge Village for opening up their historic home to us - Your knowledge and enthusiasm for this wonderful museum is truly infectious and to Jean, Ryan and Victoria, our incredible hosts and historians. 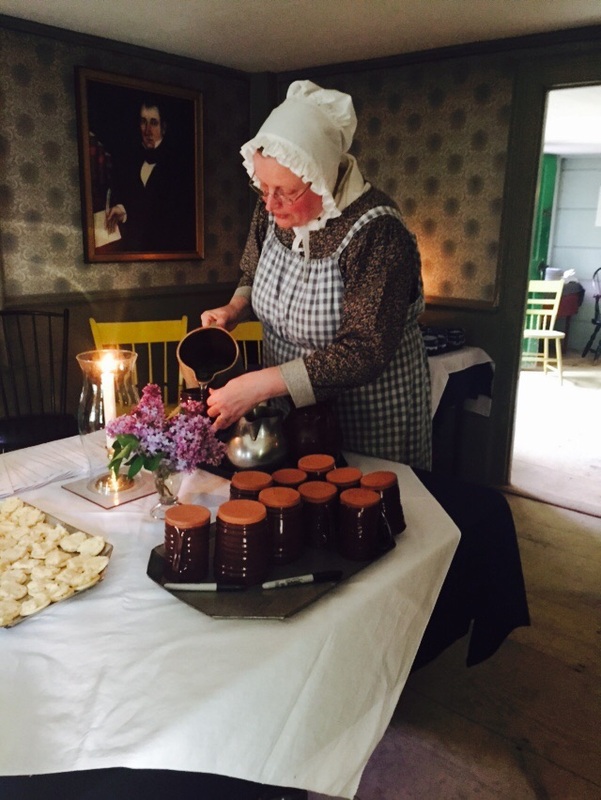 For more information on attending Dinner in a Country Village and Old Sturbridge Village activities please visit their website. I would also like to express my gratitude and thanks for the kindness and hospitality that was provided to us at the Old Sturbridge Inn & Reeder Family Lodges. The lodges are quiet, spacious, clean and inviting. Complimentary wifi is available to all guests, as is a complimentary continental breakfast. Perfect for couples and families the lodges are centrally located to a great many attractions. In full disclosure my experience and my stay was provided to be by Old Sturbridge Village. The thoughts expressed here are solely my own. About 25 years ago when I was in college some friends and I stumbled across The Bells. It is now chained off but it wasn't back then and we were able to go inside and walk among broken glass, pieces of stone, metal and brick that had given way and fallen.I thought there was something spectacularly beautiful in this dilapidated old barn. As I rarely went anywhere without my camera (then and now) we went in and took loads of photos. I had a roll of black and white film in and shot what would turn out to be some really dramatic photographs with the sunlight shining through and casting the most amazing shadows inside the building. One can no longer venture inside as the building is now fenced off. Even with my daring, I'll do anything for a photograph attitude, I was not about to risk my well-being... Had I had a hard-hat on, I might have! But I was alone, early morning, armed with only my iPhone, camera and 2 lenses. I was as taken by the beauty of this old ramshackle building as I was 25 years ago. In fact I was more taken. Because my photographs were all black and white, my memory was too. I was amazed by all the color within and on the walls. I was taken by the beauty of the destructive vandalism. I happen to love graffiti. I think it's beautiful and those of you who have been following me for a while will know this. I truly believe there is destructive graffiti that is vandalism, and I do believe there is artful graffiti. I walked around the building with my camera and I tried to imagine her in her glory. Oh if these walls could just talk! Much has gone on within the four walls and I am thrilled that the city of Newport has kept The Bells in tact and not tried to raze her. She is after all, a great part of the city's amazing history. While not The Breakers or Marble House, she has her own story to tell and her own beauty within. 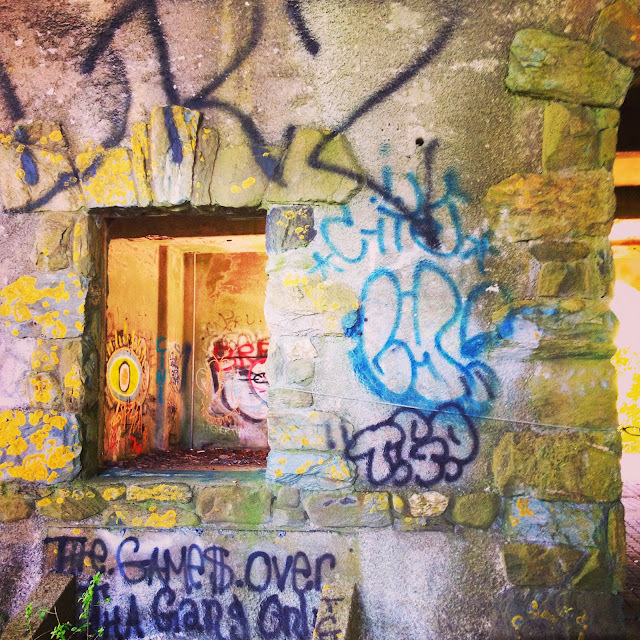 It was here, I believe, that I first fell in love with graffiti. Following is a brief history of The Bells. In 1776, during the American Revolution, a battery was set up on the southwest part of Brenton Point as a coastal defense. About 1876, lawyer and businessman Theodore M. Davis built a mansion known as "The Reefs" which later became known as The Bells. The property was then sold to the Budlongs. During World War II, Brenton Point was also considered a strategic defense area, as it overlooks the entrance to the East Passage, which allows access to Newport and to Conanicut Island. The home was seized during the war in order to erect the coastal defense battery. 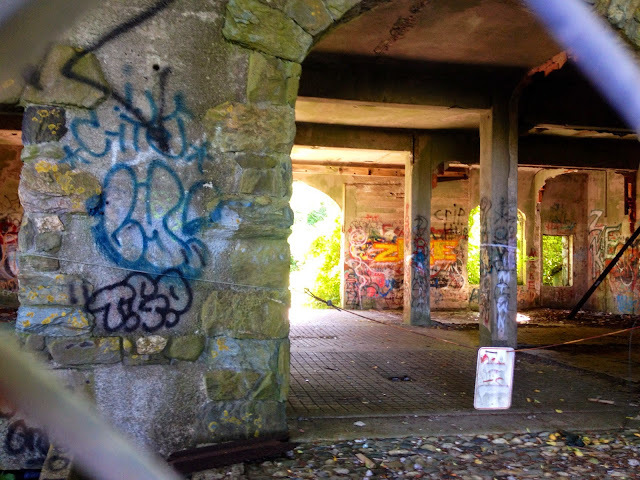 When the war ended, the battery was dismantled and the property was returned to the Budlongs, who then donated the land to the State of Rhode Island for a public park. The original manor house was partially destroyed by fire in 1960, and torn down in 1963. Today, the former laundry/servants' quarters building serves as the park's visitor center, with restrooms and the park ranger's office located inside. 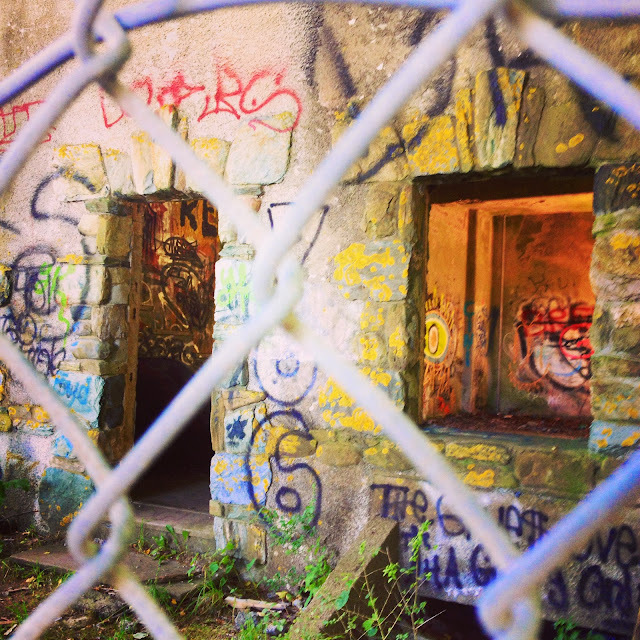 Until the mid-1990s, the Rhode Island State Park Police maintained an office in the building. The former carriage house and stables of the mansion still stand on the property. This last shot was taken from the top of the observation tower behind the old barn. It's not that high but I have a terrible fear of heights that seems to have worsened over the years. I stood in the middle of the tower, shaking terribly and clicked quickly - just for you - and hurried back down to safer ground! All images save for the one of the inside view of the barn are mine and were taken with my Canon T-3 using both the factory and a zoom lens, as well as my iPhone 4S. The image of the interior is the image of Preservation in Pink. In "Brenton Point", "Newport", "The Bells", "graffiti"